Shane spotted Heather one sunny St. Paddy’s afternoon in the line-up for the Ship and Anchor pub. They stood for quite some time before a group of little, curly-headed Irish Dancers wearing traditional peasant dresses, kilts and brats, walked past the line-up and into the pub for a performance. I never would have guessed that day that seventeen years later we would live in Northern Ontario and be closing in on our eighth year of business at St. Joseph Island Coffee Roasters. Our Ship & Anchor coffee is named after the pub where Shane and I met on St. Patrick’s Day, March 17, 2000. 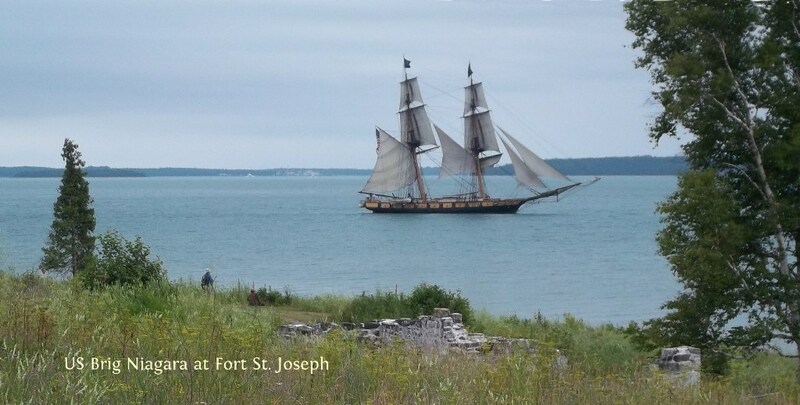 I took this photo at Fort St. Joseph during the opening ceremonies of the War of 1812 Bicentennial celebrations in July 2012. The US Brig Niagara seemed a good fit for our Ship & Anchor coffee label. 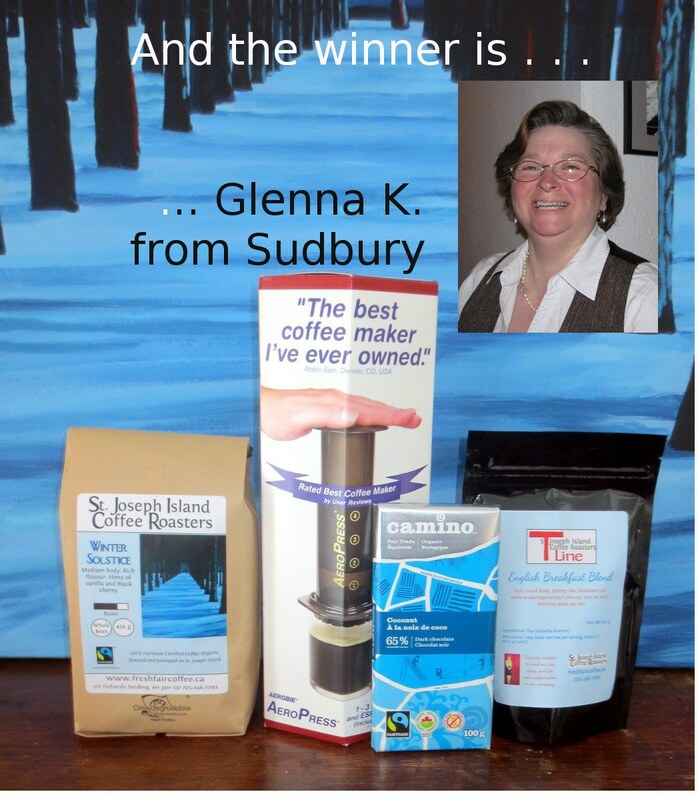 Thanks Everyone and Congratulations to Glenna K. from Sudbury! I wanted to thank everyone for taking the time to comment on our “first in a long time” blog post. We read each and every comment and will be touching upon your ideas and questions in future posts. I know some of you wondered if your comments showed up or not. I didn’t think to mention that I need to “approve” comments before they are published. This is a step that we take so that spam won’t show up on our website. I apologize for any frustration this may have caused you. I don’t usually make drip coffee for myself, I prefer the added punch of espresso. I drink my coffee strong and in the afternoon with a couple of biscuits. My favourite tea is English Breakfast in the morning, and who doesn’t like chocolate. Perfection! A lot of you seemed interested in recipes. Well, this one was obviously inspired by today’s date! I’ve adapted this recipe to how I plan on making it. (I think of recipes as guidelines, not as exact measurements that you need to follow.) 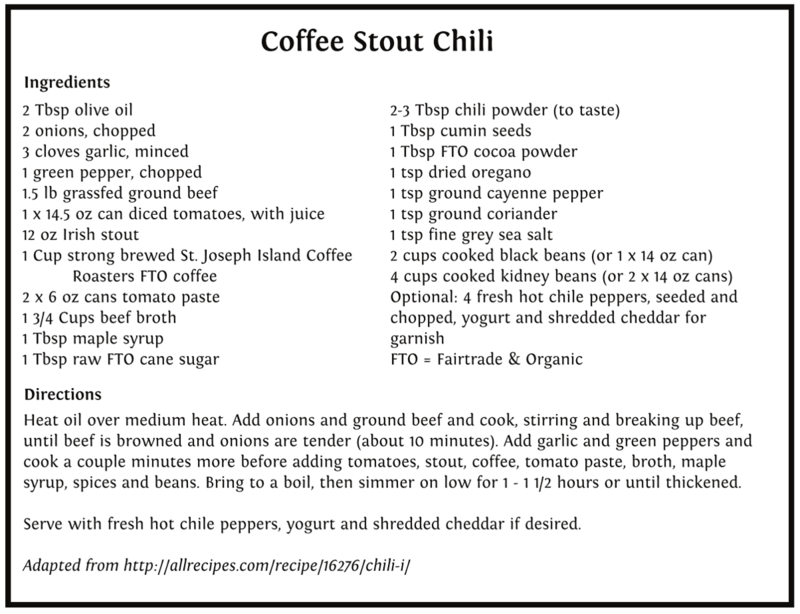 Though it probably would have made more sense for me to have tried this out first before I shared it with you, I’ve made enough chili in my life to know that this one sounds great. And, I’m a rebel like that! Enjoy!